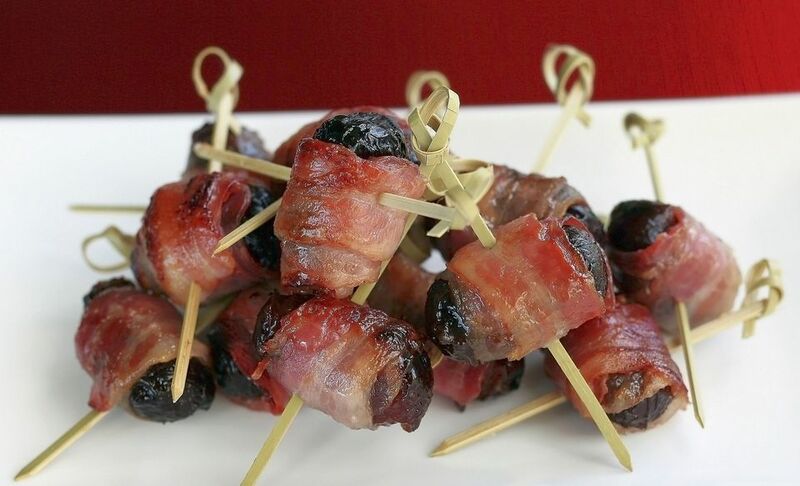 This Polish appetizer recipe for prunes wrapped in bacon, śliwki w boczku (SHLEEF-kee vuh BAWTCH-koo) is fast, easy and delicious, and very traditional. They are similar to Devils on Horseback. You can make as few or as many as your heart desires since the ingredients are simply rehydrated prunes and bacon. The real word for prunes in Polish is actually suszone śliwki or "dried plums," but often just śliwki is used for both, with suszone (dried) implied. If you want to get fancy, you can soak the prunes in Calvados which is a dry apple brandy from France and stuff them with finely chopped apples, but that's gilding the lily. Heat oven to 350 F. Line a rimmed baking sheet pan with parchment paper. Place pitted prunes in a heatproof bowl. Pour boiling water over to cover. Let soak 15 minutes. Drain and briefly dry on a paper towel. Wrap each soaked and dried prune with a half-slice of bacon. Place on parchment-lined baking sheet pan and bake 5 minutes. Turn each piece over and continue to bake until bacon is crispy about 10 more minutes. Remove from oven and drain on paper towels. Pierce each piece with a frilled toothpick, if desired, and serve while still warm. Be careful. The prune interior gets very hot!